The ECB meeting led to the rates staying unchanged however, EUR is empowered by the inflation rate in Germany and Spain. 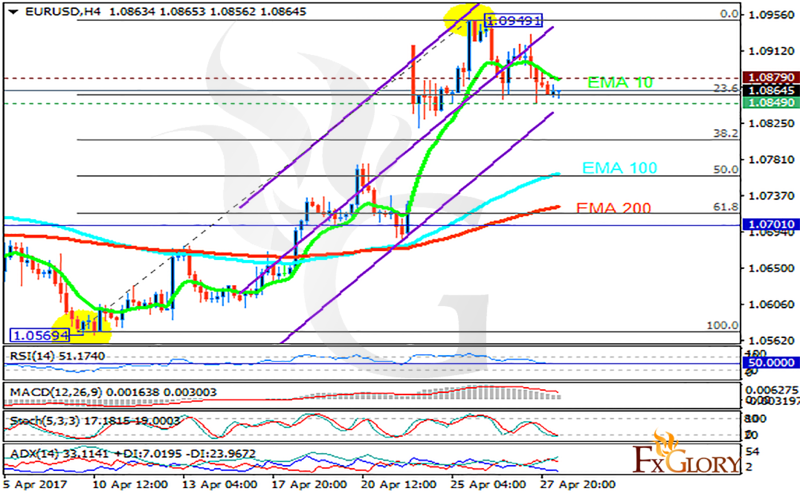 The support rests at 1.08490 with resistance at 1.08790 which both lines are above the weekly pivot point at 1.07010. The EMA of 10 is moving with bearish bias but it is above the EMA of 100 and the EMA of 200. The RSI is moving horizontally on the 50 level, the Stochastic is showing downward momentum and the MACD indicator is in positive territory. The ADX is showing weak sell signals. Considering the strong EUR, the pair will continue its bullish trend along the ascendant channel targeting 1.09 however, taking the indicators into account, short positions are recommended towards the 61.8 level of Fibonacci. It’s better to leave EURSD today and wait for better signals.